John Carter gave the call numbers for the Grand Fleet, and his own code. “This is John Carter Prince of Helium, does anyone hear me?” he spoke into the ornate microphone of the unit. There was no answer. He gave the message again and once again was greeted by silence. “Who are you trying to call?” asked Sha. “The unit is Zoldangan, maybe they are calibrated differently,” the Warlord said, almost to himself. “Maybe I should try to call Zoldanga? They are allies of Helium now.” commented John Carter as he readjusted the dials and gave a new message. “This is John Carter, does anyone hear me? Please respond. Tell us that you are picking up my call. If you hear this message contact Dejah Thoris in greater Helium and tell her we still live.” Once again, there was only silence. The Warlord tried other city states as well, Dusar, Zor, even the station at the Valley Dor. Still, their was only silence. One of the Raska were looking out a narrow window to the plaza below. He looked over and saw many of the bodies were dismembered by the Raska, their hate couldn't be contained. The ex-slaves quickly looted the dead and heaved the remains out the narrow window. The sight of these birdmen falling to the ground caused the Emerin to pause. John Carter tried to reach Helium again but once again there was no reply. In desperation he tried the frequency of the Dator of the First Born in the sea of the Omean. “Warlord, you were given up for dead. Where are you?” crackled the speaker. This filled the Raksa with wonder. “Yes, we have legends of such a thing. Is there any other way out of this cave world?” came the radio signal. 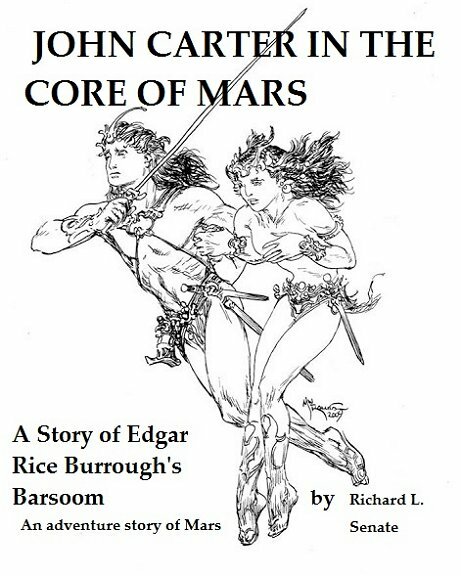 “All of Barsoom will rejoice at this news,” came the message from the First Born. John Carter could hear the pounding on the barred portal. “I must sign off now,” he said. “I still live!” With that he turned off the machine and drew his sword. One of the Raksa had discovered a hidden door that lead up, to the roof of the building. They took up the task of breaking things with a grim determination and even tossing them out the windows. One by one, they ran up the stairs. The Warlord helped block the door to the stairs and as the panel gave way he closed and locked the door to the roof. He fled up where the great ray cannon was located. It was huge in size and resembled nothing so much as an eleven inch Naval Cannon. A tangle of wires linked the thing to the control room below. “Watch out for Emerin Flyers,” yelled the Warlord. “I wish we could use the Ray on them.” mused Sha. “Maybe we can.” added John Carter, as he looked over the huge weapon. Levers controlled the aim of the thing. He found a large metal bar and used it as a lever. “Help me, topple the ray gun over to block the stairs!” The Raksa quickly took up the metal bar and soon the heavy weapon was rocking and fell over, rolling and blocking the door to the roof. “That should keep them out for a while.” John Carter said. “But, sire, how can we leave the roof?” Asked Sha. “Take up the wires that connected the weapon to their controls, we can use them to clime over the side.” commented the Warlord. The ex-slaves went about collecting the heavy cables and lashing them together. John Carter knew they may not have a chance to use the “rope” but, the activity would keep them from worrying about the battle that would be soon fought on the roof. He didn't know if he would survive this last encounter, but John Carter was always an optimist. He felt that he would survive this conflict as he had all the others he faced in his long career on Earth and Mars. The Building had a flagpole where the ornate multi-colored banner of the Emerin floated. “Here sire, this cloth will do,” It was a piece of blue cloth he found. It was a large tarp. “Now if we only had some paint,” commented the Warlord. “Will this do?” asked another ex-slave. He had a jar of grease used to lubricate the ray cannon. The new flag went up with a cheer. It was an act of defiance. John Carter could hear pounding on the door to the stairs now. They would break through, even with the heavy ray cannon blocking the way. He was right when he said the Emerin would never forget John Carter. A cheer went up when the explosion broke a large breach in the high walls of the White City. The Raksa were making their way forward, fueled by years of rage and a deep set desire for revenge. Turan lead the charge, joined by the gorillas, who came as allies to the Raksa. The Emerin withdrew hoping the great ray would handle the invaders. The few birdmen who resisted were shot down in a flurry of crossbow darts. The ray, that killed so many, silencing the Radium cannon, was strangely silent. “We have them on the run, lets free the slaves. This is the revenge of the Raksa!” This brought a cheer from the former slaves. Even the grorillas beat their chests and grunted in accord. Even as they entered the hated city, they were joined by slaves who were armed with tools and clubs, ready to fight. “The Kali-Maaka said this would happen—we join you to strike for our freedom!” one of the newcomers said. Another flaming shaft flew through the sky and struck a building exploding in a shower of flames. Smoke from several fires marred the city. Some of the fires seemed out of control. “Where is the Kali-Maaka?” asked Turan of the slaves who joined them. “Look, look!” cried one of the Raska to Turan, pointing at the tower. A new flag flew over the building now—a pale blue flag with three symbols pained in black on its surface. “Kali-Maaka must be saved!” cried Maas. She turned to the gorilla and signed a message to the anthropoid. The ape nodded his head and with a dozen hairy apes ran into the city. In moments they were swinging from the roofs and making their way to the tower with the flag. “They will go to him,” assured Maas. “Every Emerin in the city will be gathered to capture him—we must save John Carter!” cried Turan. “Save Kali-Maaka!” several of the Raksa chanted. Without waiting Turan lead them into the streets where the Emerin were setting up barricades across the streets. A flaming projectile hit the building above the barricade and sent fire raining down on the Emerin defenders. They scattered, falling back into the city, deeper in the maze of alleys and courts. As the invaders got deeper in the city, the former slaves joined them –some were armed with captured weapons. Now Turan could see smoke from burning buildings at every section of the city—some set by the catapults others, he believed, set by the slaves. The Gorilla Kunge returned and swung down to Turan and Maas. As soon as he reached them his hands were swiftly moving, signing a message. “Kali-Maaka is in a building, on the roof, over a thousand Emerin surround the place and they look to seize the structure.” she translated. “Lead us! We will break though and save him!” cried Tar. “We may not be in time---we must find another way,” explained Turan. He had a plan but would it work? “I fear we can not hold out for long,” commented Sha as the door to the stairway was slowly splintering under the swords of the Emerin warriors. “We still live! While we have life, we have hope!” encouraged John Carter. “I hope to die before I am taken, for I know that my fate will be the kitchens to be eaten or cooked alive,“ murmured Sha. “Don't give up!” commented the Warlord as the Emerin started screeching like a thousand banshees. It sent a ripple of chills up his spine. The Birdmen were angry and lusting for blood. He knew that if he fell into their hands his end would be slow and painful. The door fell away and the feathered warriors flooded in, their beaks were bright red with rage, the toppled ray cannon held them up for only a moment and they came at the ex-slaves. The clash of steel on steel filled the air. Slowly, a smile came on John Carters lips as he engaged two of the creatures in a sword fight. He found the creatures were poor swordsmen. They fell in a dozen passes. His victory was not duplicated by his former slaves, who fell to the creatures, a few even leaped from the roof least they be captured. One seized an Emerin and together they toppled to their deaths below. Sha was still fighting, his blade swirled with passion rather than skill, but two of the birdmen fell, their skulls cleaved by his long sword. “Victory!” cried the Warlord, “Freedom from the birdmen! Death to the Emerin!” He oped his brave words would encourage his men. “Better death than chains!” answered Sha as he killed another with a powerful decapitation stroke. But with each death the bird creatures came on with new reinforcements. Now John Carter heard something he never experience before on his sojourn to Barsoom. They were gunshots! Lots of them. “It must be a Maxim Gun,” he said to himself, “that or a Gatling Gun. Where did they get them?” He knew the answer, from Earth with their ray. They only deployed them once the ray was out of action. He knew the revolt was doomed now. He saw Sha fall to the swords of four feathered warriors, he was pushed to the edge of the roof as the creatures pressed him. In moments the last of the former slaves were outnumbered and cut down, Only John Carter was left. They were coming at him from all sides. His back was to the rail of the roof as he fought now as he had not fought in decades. He knew he stood no chance of victory so he must sell his life dearly. He was dueling with a tall Warrior with a red topknot of feathers. He was a good swordsman, perhaps the best he had faced in the White City. He was exhausted now, weakness coming as he fought out of desperation. He had to parry an attack on his left side by a birdman, that left him open, The tall red feathered one came in and with a powerful filp of the wrist, disarmed John Carter. Only extreme fatigue could explain his being disarmed. The sword flew though the air and over the railing to the street below. He saw the tall birdman raise his sword for the death stroke. Them, John Carter saw an arrow bury itself into the warriors neck. He fell dead before he could deliver the killing blow. More and more arrows came, the Emerin fell back under a rain of shafts. He turned and saw an Emerin flyer, filled with Raksa armed with crossbows. Turan was at the controls. “Quick Sire, jump aboard.” he cried. “I don't need to be asked twice,” he said as he jumped over the wall and more of the birdmen came up the stairs. Turan flew away. John Carter could see the fires were being put out and the streets filled with dead. He hear the rattle of the machine guns working over time now. “Maybe when we land....” The warlord was unable to speak further as bullets hit the ship and caused the frame to tremble. “I ordered a general retreat, back to the caves,” added Turan. He climbed higher, out of range and flew back towards the cave villages of the Raksa. The Warlord took one of the crossbows from the cavemen, and looked it over, admiring the handwork of the weapon. “We thought the new weapon would win the day—we were wrong.” Commented one of the caveman warriors. “I think Helium should make some of these weapons—and so should Zor.” added Turan. John Carter just shook his head. “I think not,” he answered. “But I sent a message to the first born—there might be away—an underwater channel from the Omean to the central lake—by submarine. “At least they know we are still alive.” Turan commented. “But for how long?” asked one of the Raksa, “Look!” be was pointing back to the White City. The fires were out now and dozens of air ships rising from all parts of the city. They could see a massive army of the bird warriors forming at the gates. They would avenge the attack on their city. The Raksa Army was scattered now. John Carter could see this was becoming a route. Turan piloted the airship and landed at the entrance to the cave city of the Raksa, many were gathered to meet the Warlord. “We better be ready to defend the caves and welcome the survivors,” he said. “The Dator of the Emerin will be hitting us with all they have. “I must rejoin my men!” announced Turan. “No, Warlord, You are too valuable. Stay here and organize the defense of the caves,” snapped back Turan. “Who are you to question the word of the Warlord of Barsoom?” shot back John Carter. He wasn't used to being spoken to in this way. John Carter watched as the ship took off and headed for the retreating army. For a moment he felt helpless and alone. “Father, the council of the Raksa are waiting, with the new many shots weapon the Emerin have they will slaughter the cave people.” said Valla. The Warlord was silent as he walked back to the caves—mostly women and children now—all pleased he had returned but he knew that many of the Raksa men would never return. He knew Turan was right, he must defend the cave city from the earthly weapons of the Emerin. The council of elders, people marked with wrinkles and scars, women and men. Gathered around a low came fire under an over hang of rock. John Carter sat down, deep in thought. He wanted to tell them he wasn't their expected savior. But, time for such admissions had long passed. “What of the weapons recovered from our downed airship?” he asked. “We have only a few—most were taken to the attack on the hated city.” answered Zet the leader of the Raksa. “We will need every dart, arrow, and any other weapon if we are to defeat the Birdmen this time.” Commented The Warlord. “Could you show us how to make a many-shots gun?” asked Zet. He gave them the formula for gunpowder. He then took a stick and drew out the plans for a large catapult and explained how they work. The old man smiled. As another copied the plans onto a piece of bark and ran off to start construction of the new weapon. “Now we must plan for the defense of the caves,” started The Warlord as he drew a simple sketch of the caves and the entrance to them. Turan, landed in a glade not far from a group of warriors setting up a rear guard. Some were armed with crossbows, a few were Helimetic warriors with radium guns and swords. He could hear the chilling chatter of the many-shots gun. “Many have died, Turan of Zor, the strange chattering gun has cut down many brave warriors.” one of the Heliumetic officers said, his face grim with the look of defeat. “Where is the Warlord?” the man asked, glancing around the ship. “John Carter got a message to the outer world. The First Born may well send troops to us. With the ray out of action we can keep these cannibalistic monstrosities back and maybe with the help of the First Born we can crush them!” announced Turan. “At least Valla and the Warlord are safe.” the warrior commented. Turan nodded his head. For that he was thankful—even if he knew she would be a grim fighter and a formidable shot with a pistol. the others just nodded their heads in somber determination. The started to dig in, in moments the advanced parties of the Emerin appeared. Soon the chattering Maxim gun started to chew at the jungle foliage as the Raksa kept low and let the bullets fly over them. They didn't return fire until the feathered creatures charged. Then the came out of their holes and fired, radium shells, darts and arrows caused the Emerin to falter and fall back. The Machine gun now chattered its death song and several of the rear guard were hit and ripped to pieces. Another charge came and was stopped but Turan could see the enemy was trying to get behind them under the cover of the many shots gun. “Retreat, Fall back, let us set up another line!” he ordered them. But deep in his Barsoomian heart he was loathed to turn his back on a foe. Another fell as they withdrew back down the jungle glade for another chance to ambush the birdmen. At least these actions might give the ex-slaves and wounded a chance to find some safety in the cave city. Looking at the strange bowl like horizon he could see the Emerin was massing a huge army—he had no idea their were so many of the creatures. The Raksa would be outnumbered several times. He would rather die facing these creatures with a sword in his hand than be taken alive for their cannibal feast. “Be sure the counterweight doesn't hit the ground when the catapult is fired,” cried the Warlord as they winched back the long arm with a crude bronze and wood block and tackle. Valla was watching, taking a break from helping to make arrows with stone and bronze points. Her father said they must make lots of them –so many they will fill the sky with them. Others, mostly women, were being trained to shoot the bows and arrows. Valla was excited. She would be in the middle of a major battle. The fate of the inner world hung in the balance. Who would rule? The Emerin or the Raksa? A large stone was loaded into the sling of the big weapon. The warlord gave the order and the catapult fired with a swish of the arm that sent the large stone in a high arc to crash into the Forrest below the entrance to the caves. The large crossbow was also set up behind a wall of rock and dirt and trenches several layers deep as well as poles with sharp points pointed towards any who would attack. “I haven't had this much fun since we fortified Petersburg in the War Between the States.” said John Carter to his daughter. “I have not heard of that war?” she asked. “Now we must finish this one.” commented Tet as he shouldered his crossbow. Little by little ex-slaves and survivors of the attack on the White City staggered in, exhausted, some with wounds, but the Warlord knew that if they rested, they would fight to defend the caves of their people. Every man would be needed for the coming fight. Turan was still fighting, Valla was waiting for him, checking each man as he came up the trail from the jungle to the entrance. She saw Maas, Tar and the ape come in. “Their were too many of them—and that terrible chattering weapon,” Maas said, looking at Tar. Valla could see the girl was wounded in the leg. Valla could not think of anything to say, she just helped them back to the caves set up as a hospital for the wounded. In her heart she felt her feeling of impending defeat—but he soul, the soul of her father, refused to admit that the enemy could win. In the cave, she saw some of the others who made it back from the attack on the White City. Many were wounded. She wished the doctors of Helium were present. She the First Born woman Xoiana helping a warrior who had lost his arm. “Let us hope we all live.” answered the woman as she rolled bandages. Valla went back to the cave where the arrow makers were working. One of the young women were bundling arrows, All the bronze points were used and they were using stone points on the new arrows. The Raksa made colorful shafts and arrows but now they left the shafts plain – They were quickly made and they had no time for ornamentation Valla went back to using a heated stone to straighten the wooden shafts, the way she had been taught by an old woman. She liked the work—it kept her mind from worry over the fate of Turan. “ Valla, come quickly,” came a voice –it was Tar the tracker. The tall caveman didn't answer but gave her a grave look. They were heading towards the entrance to the cave village. She saw her father bending over a stretcher. “Is it..Turan?” she asked knowing the answer. “He asked for you,” Tar said. She could see he was wounded. Blood colored the stretcher red. Valla started to run, her heart pounding. Tears formed in her eyes. John Carter look at his wounds, His leg was hit in the upper thigh so too his lower torso. “Father, will he live?” Valla asked. “We have some Barsoomian Salve from the ship that may well heal the wounds,” he told her. “How awful!” she said with a gasp. “There must have been many one legged men in your land,” added Turan. “I want to fight—defend the village from the feathered ones.” Added Turan. “Yes, Father,” She was in tears now and followed as they took the stretcher back to the caves. “That's, bad luck,” murmured John Carter. “I was hoping for Turan to help with the defense of the village. The fortunes of war.” Zet was standing close by and nodded his head. He too had seen the grim face of war. Below the last of the rear guard were climbing up the hill to the entrance to the cave village. The Warlord watched as the exhausted warriors straggled in, Crossbows empty, spears and swords all they carried. Many were wounded—but the looks on their faces showed they would fight. Below they could see the advancing Emerin, their seemed to be ten thousand, if not more, of the creatures, Some with rifles, some spears, all with swords. They were excited with the thought of victory. Their beaks were scarlet. As they gathered for a charge. John Carter helped lift a black pot filled with gunpowder into the catapult. A burning reed was brought to the bomb and the fuse lit as he pulled the lever to fire the catapult. It flew with a swish, sending the pot, end over end down the mountain and towards the group of birdman. It landed and rolled, the Emerin gathered close to see what it was. It looked harmless—until it blew up sending dozens of birdmen into the land of the dead. “Load another one!” cried John Carter. He saw that a smaller bomb was lashed to the point of a huge arrow for the large crossbow. The fuse was lit and the thing fired, sending the Emerin running. It hit a tree and buried its point into a trunk before it exploded, killing more of the foe. “Now another of the large pots!” ordered the Warlord. They rolled another into the winched down catapult and lit the fuse! It was fired but this time the Maxim Gun was aimed at the bomb and it exploded midair without harming any of the massed warriors. “Load the fire brands!” Yelled Zet, the chief. And John Carter helped to put the grass and skin covered rock into the catapult swing. It was set on fire and released. The Machine gun bullets hit the burning bundle and had no effect as it struck the jungle and set a birdman on fire. His screams seemed to send panic into the ranks of the Emerin—more than the bombs had done before. “They hate fire,” informed Zet to the Warlord. “Lets give them more!” smiled John Carter. Now the Emerin unloaded with all they had, exploding spears, rockets, machine guns and rifles. The barrage forced the Raksa to duck low in the trenches as bullets flew everywhere. Two of the cave men were hit by the unexpected fire. “Keep down,” yelled the Warlord, as some of the men attempted to pull down the catapult but before they could, bullets ripped the wooden arm of the weapon, and rendered it useless. Then, in moments, they came, screaming with high bird calls, running up the grade towards the entrance to the cave village, They seemed to be thousands of them. “Now!” screamed The Warlord, somehow pleased to be about to enter battle. “Give em all we have!” The large Crossbow was fired and exploded in their ranks as a thousand arrows and darts filled the air with a wave of death. Those with radium rifles opened fire as well. “Light the fuse and roll them down on the pigeon heads!” ordered John Carter. This was done but to roll the large pots, the Raksa had to expose themselves to fire. Two more cave men were wounded. The bomb did its evil work and slowed the attack—but the delay was all that was gained. They were almost at the entrance now, the hillside covered with their dead—but still they came and John Carter could see more were on the way. Now he saw the Flyers coming, with Maxim guns mounted on them. “Yes, Warlord,” Djor said as he concentrated his fire on the closest skyship. He aimed for the buoyancy tanks and was rewards when the ship plunged to the jungle. A short cheer when up from the cave men. “Good shooting! Djor—your father would be proud.” John Carter said. But the waves of Birdmen were coming closer with each attack. He could see they were pulling a machine gun on wheels forward. “Concentrate your fire onto the Maxim Gun! Don't give them a chance to set up!” he yelled. “I'm all out of ammunition,” cried Djor. “Use anything you can.” answered the Warlord. Djor picked up a crossbow. Loaded it and sent a dart towards the machine gun—it missed. Others started to send arrows towards the four birdman warriors who were setting it up. One of the feathered warriors fell but he was replaced. John Carter knew that soon it would be spraying death at the entrance. He knew he should order a withdrawal but he was loath to do so. He saw they were loading the oversized crossbow with an exploding shaft. He went to them and helped the wind back the bow. He had a torch light the fuse and, carefully aiming the piece he pulled the lever and sent the 11 foot projectile towards the machine gun. As it left the earthwork fort the machine gun started to chatter. It hit the arrow and it exploded harmlessly midair. They began to sweep the fortifications with bullets, forcing warriors to keep down. The arrows began to drop off. The Emerin were coming up the hill to the entrance, under the covering fire of the machine gun. “Thank you Zet! I would be proud to fight next to you.” answered the Warlord. Just then the feathered warriors screeching, came over the earthworks. The first dozen fell to darts and radium bullets but, they were followed by more that came in waves. Even John Carter had to admire their bravery as they came on fearlessly. John Carter saw a spear from Zet cast and hit a birdman in the chest, dropping him. The Warlord drew his sword and rushed to the mass of the enemy. He was surrounded, and fighting for his life. He didn't think he would survive this battle. At long last he would find death in the inner world of Mars. One birdman, a tall savage warrior, was about to strike a death blow when his head exploded! He looked back and saw Valla, with her pistol, held with two hands, shooting. Another attacker went down with a classic headshot, and then another who faced him died with a chest wound. He saw that some of the Birdmen were armed with Earthly six-shooters and were drawing them now to finish off resistance. Each one who aimed at a caveman or John Carter fell before they could fire. “Fall Back!” he yelled, “To the caves! We will stop them there!” At his words the birdmen screamed out in victory. Valla was standing her ground—until he saw Maas was pulling her back into the cave city. “What is the Alamo?” asked Maas. They ran back where the warriors of the Raksa were gathering to make a stand. Before the first of the caves. They were joined by women with spears and bows—it looked pitiful but Valla and John Carter stayed with them to face the advancing horde.